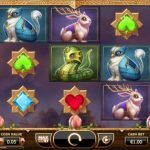 Nirvana is a video slot game from Yggdrasil that does not only have a beautiful design but also it has plenty of features to offer. The reels take the whole screen and are placed in what seems like a very peaceful place to be. There are all sorts of mystical creatures here in this game that can help you land some good prizes. The whole action revolves around the free spins round which is activated by landing 3 or more lotus flower scatters. 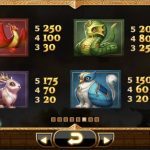 You will receive 10 free spins and 3 bonuses you can choose from. 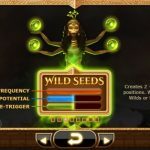 The first one is Wild Seeds where you get 2 to 4 wilds on each spin, Mega Reel where the second, third and fourth reel become one giant symbol and Nudge Reels where at the end of the spin, one reels is nudged up or down if there is a possibility for a bigger win. The feature does not end here, which is of course great news. If you land 2 scatters within the feature you will receive 1 extra spin, 3 scatters will reset the spin counter to 10 and you can pick another feature and landing 4 or 5 scatters again will reset the counter to 10 and it will add another feature. Nirvana is an amazing game that we always enjoy playing. This game comes from Yggdrasil, which turns out to be a very promising software provider. The first thing that we noticed when we started laying this game was the theme which has a calming vibe. The thing that keeps us coming back for more is the free spins round. The good thing is that is easy to be activated and it can be quite lucrative if you are lucky of course. For another great engaging slot you should consider playing Lucha Maniacs a 5 reel slot by Yggdrasil.